Can Westerners meaningfully engage with Ayuhuasca? Mexican-Israeli mastermind, Adam Andros Aronovich, lives in the Peruvian Amazon and works as a research coordinator for the Chaikuni Institute and the Temple of the Way of Light. He is an active member of the Medical Anthropology Research Center in Catalunya and has written for various publications around the world. This is an abbreviated version of his original article featured in Pysmposia digital magazine. The Chaikuni Institute is a nonprofit organisation located in the Peruvian Amazon Rainforest. It is partnered with one of the most successful retreat centres in the Peruvian amazon, the Temple of the Way of Light. 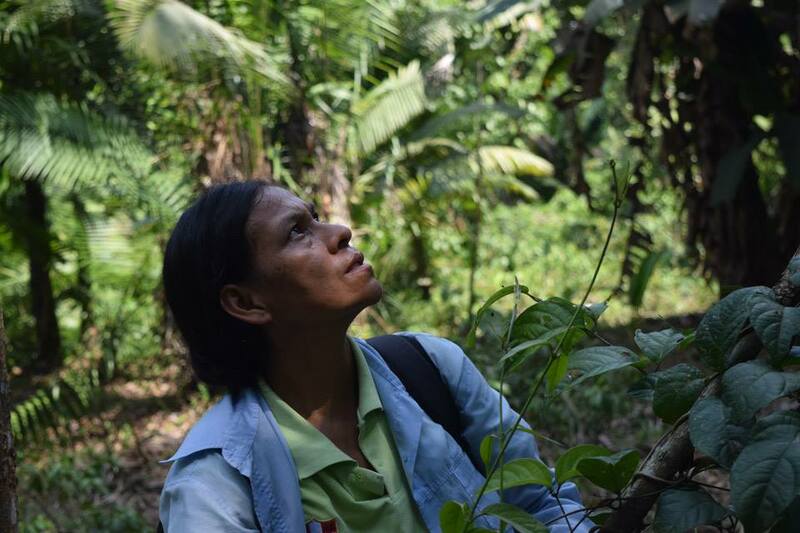 The organisations are currently experimenting with the cultivation of ayuhuasca, a traditional medicine used in indigenous ceremonies, inspired both by Western permaculture principles and indigenous philosophies based on reciprocity and interdependence. They currently have over 1,000 plants of the slow-growing vine in their rainforest land. One of the main points stressed by indigenous leaders is that ayahuasca is one of thousands of other botanical resources found in rich and diverse medical systems. Its use in rituals is embedded within an enchanted worldview that ascribes agency and intelligence to the vegetal realm. Plants are not necessarily seen as sprouting pharmacies to be exploited by humans, but as conscious spirit-imbued sentient beings, masters of alchemy, with whom we can respectfully communicate. As Westerners, heirs to our own materialistic, anthropocentric mythologies, it may make more sense for some of us to work in a reductive, molecule-based level. It is important, however, to be aware of the unanimous plight of the indigenous leaders, to respect their traditions, and at least make an effort to understand their worldview. In order to address this particular problem, The Chaikuni Institute not only provides legal advice and other empowering services to the communities fighting ecological devastation brought about by oil companies, but has also put its dedicated team of forestal engineers, permaculture workers, and gardeners at the disposition of the surrounding communities in order to participate in communal projects and co-create sustainable income opportunities for local farmers, many of whom work for the Temple. Furthermore, both local workers and Amazonian indigenous students from the city of Iquitos are invited to attend ayahuasca ceremonies at the Temple for free. Many of these students hail from ashuar, kichwa, awajún, and nine other Amazonian communities. Most of them have never drank ayahuasca before. In fact, many of them fear or outright dismiss it, buying into centuries of religious demonisation and cultural devaluation of their own traditions. Besides including them in the activities of the center, it is an exciting opportunity to re-introduce this medicine to younger generations of indigenous communities who (as May writes in his article citing Langdon) tend to “increasingly adapt modern Western paradigms in order to avoid discrimination,” causing a sharp decline in the number of practitioners of traditional medicines. Without a shadow of a doubt, there is always room for further healing the deeply patronising and imperialist roots of Western presence in the Amazon. Yet there is something about the recent ayahuasca boom, and the kind of people that it brings to the jungle, that feels radically different to previous enterprises. This new wave of foreigners settling down in the jungle are not necessarily the power-hungry and greed-driven entrepreneurs of the past—at least not all of them—but people who, having worked with medicine, and having incorporated the principles of interdependence and reciprocity into their worldviews, are genuinely and honestly interested in building sustainable and horizontal relationships with the locals, giving back to the communities that sustain their centres. The Westernisation of indigenous communities has been a historical fact for a long time, and the pervasive stigma attached to native practices is a palpable reality. There’s a long legacy of rampant bio-piracy and appropriation of indigenous tools and wisdom by misguided new-agers and perhaps well-meaning but self-deluded neo-shamans with a shallow understanding of the real depth and complexity of these worldviews. The jungles of the world, both vegetal and urban, seem to be filled with itinerant medicine providers that may not be there holding space the day after—or the week after—latent, overpowering processes finally unleash. In a way, these are all inevitable byproducts of a culture that is coming to terms with its own institutionalised madness, that is under the spell of a potential panacea for the affliction troubling Western minds. It holds great potential for healing, but also for dire trouble. Amazonian “shamanism”—particularly in Peru—as pointed out by one of the presenters at the (World Ayahuasca) conference, Evgenia Fotiou, is far from being a benevolent edifice solely at the service of healing. 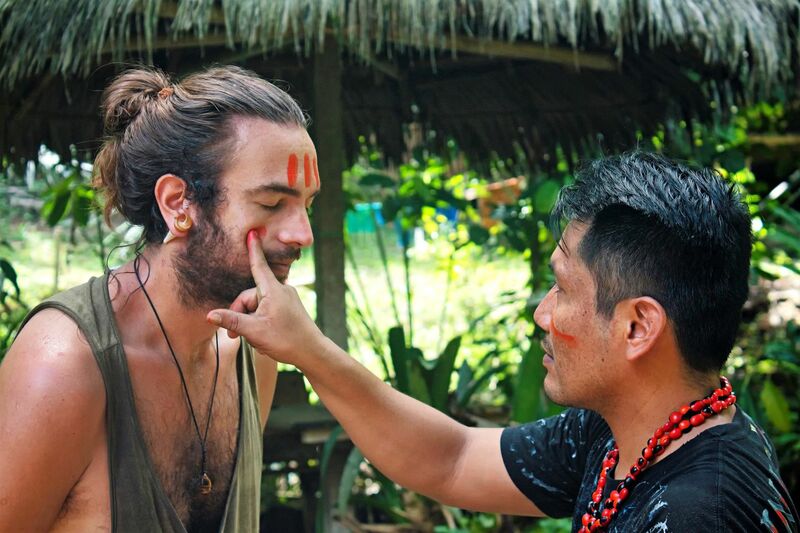 Maestro Shipibo Moises decorates Research and Communications coordinator, Adam, with the crushed seeds of the Achiote (Bixa orellana) plant, or “Joshin Mashe” in the Shipibo language. For people living in tribal or communal societies, the end of a ceremony simply signals their return to communal life. For most of us living in highly industrialised and individualistic urban environments, the end of the ceremony usually signals a return to our exhausting and often alienating routine. How can we properly bring down our ethereal insights into practical use when we are immediately thrown from the comfort of the ceremonial space back into the chaos of city life, accompanied by familiar and perhaps maladaptive behavioural and relational patterns? It is essential to set aside time and energy dedicated to the proper digestion and assimilation of the experience. Otherwise, we may run the risk of having our beautiful insights and deep realisations evaporate amidst the hustle and bustle of traffic jams, bank queues, or family dinners. Reciprocity and mutual care, pillars of survival and balance in traditional communities, have all but disappeared in Western cultures, where most relationships have been commodified to some extent. This could be the key to these conundrums: The cold, calculating lens through which the hyper-rational Western mind mistakes vibrant living forests for resources to be extracted, that naturalises poverty as an opportunity to make profit, and devalues ritual and magic as primitive superstition, has a lot to learn from cultures that still “think” with a beating heart. And vice versa: It isn’t about demonising or rejecting scientific knowledge or Western interest. We must all look forward. A true dialogue must encompass the best of both worlds, which, in reality, is only one. One world that we must all learn to heal and sustain just as much as it sustains and heals all of us.